Deals on Wheels spoke to the American owner of a 1960 Peterbilt truck used in an early Steven Spielberg movie titled, Duel. 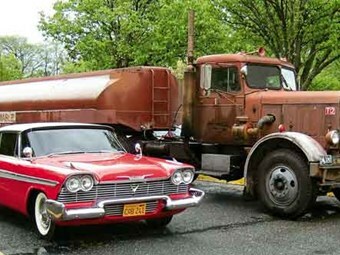 Brad's famous 'Duel' 1960 351 Peterbilt alongside a red Plymouth Fury! I remember watching Steven Spielberg’s Duel many years ago. It was a thriller and the starring role was played by a big, rough Peterbilt truck that harassed the daylights out of a travelling salesman (played by Dennis Weaver) as he drove his Plymouth Valiant through the California desert. The fact that we never saw the truck driver, apart from a brief glimpse of his arm and snakeskin boots only added to the suspense. I always think of that spooky truck if one ever tailgates me. And because I’ve never forgotten the movie, I thought of finding out more about what happened to that truck. I managed to track down Brad Wike, the owner of the backup truck made for the movie—a 1960 Peterbilt with a Cummins engine. The first one was destroyed in the making of the movie (I won’t say what happened in case you haven’t seen it). When we spoke, Brad, who runs a trucking business—BPW Transport in Lincolnton, North Carolina—was busy trainspotting with his eight-year-old son Nathan on the Georgia/Florida Stateline. "Sunday is the perfect day for it because trains head out from all over the states to Florida," he says. After the movie was made, the Peterbilt was sold to several other people before Brad bought it in 2009. Being a fan of the movie—"I must have watched it more than 100 times, he says"—a trucking man, and a collector of classic trucks, he knows a lot about its history. "The truck sat around in Agua Dulce in California for about 30 years before Neil Losasso bought it in 2004. He was an avid fan of the movie. Neil then sold it to collector Dan Bruno from St Louis, Missouri. He kept the Peterbilt for a couple of years, then his wife told him he had to get rid of something. I guess he had too many toys. He knew I was a collector, so he contacted me and I decided to buy it. "Duel came out as a TV movie in 1971, and in 1974, they made additional scenes to make it into a full-length movie. The first truck was destroyed and I don’t know, I guess it was hauled off for scrap. It would be neat if they had that original smashed-up one somewhere you could go and look at. They didn’t have a clue the movie was going to be successful or they would have kept it. Today, Steven Spielberg is one of Hollywood’s biggest directors. At the time, he didn’t know Duel was going to be a big hit or even where his career was going. 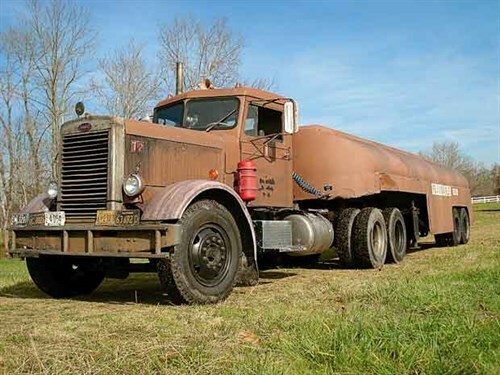 "My Duel truck is the 1960, 351 Peterbilt with a Cummins NTC, 350 small cam engine, with twin stick transmission, or 5 + 3, so is a 15-speed (double overdrive) plus a specially constructed tanker (1948 model). Its top speed is 70 miles per hour." The first truck was a 10-speed with a single stick. "Dan Bruno changed the rear end, adding a Reyco suspension. The original suspension was so worn out that when the truck turned, the inside of the tyres would rub the springs. He added a new fuel tank because it was rusty inside and he kept having trouble with it. He also rebuilt the Cummins engine and changed the Cummins air cleaner to a Cat one, just like in the movie." Since owning the truck, one of the only things Brad has done is add a swamp cooler (air conditioning) to the back of the cab. He says, "It looks rough and beaten and it’s one of the hardest trucks to drive. No power steering, no Jake brake, nothing. It’s a rough riding beast but it played the part well." To add a touch of authenticity, Brad recreated the other part of the duel, a red Plymouth Valiant that’s parked alongside the Peterbilt at show time. It was apparently a coup on Speilberg’s part to get actor Dennis Weaver to play the part of the travelling salesman. "He was already a big movie star so it was a big deal. He played the wimpy salesman so well. It was a great combination: that wimpy car—a 4 door Plymouth Valiant—and a truck that scared the heck out of him." The movie is still a big hit today, according to Brad, and so is the fascination with the truck. "I’ve had people trying to buy that truck from all over: Scotland, the United Kingdom, and Australia, but I’m not that hungry yet. I’ll hang onto it. Besides, it’s my favourite show truck. You don’t have to clean it up. The dirtier it is, the better they like it. Actually, they used the same tractor unit in an Incredible Hulk movie and in a David Lee Roth music video, too. It was painted green and used in a clip called, ‘She’s my machine.’"
Perhaps it’s no surprise then that Brad’s business, BPW Transport, is run on Peterbilt trucks. 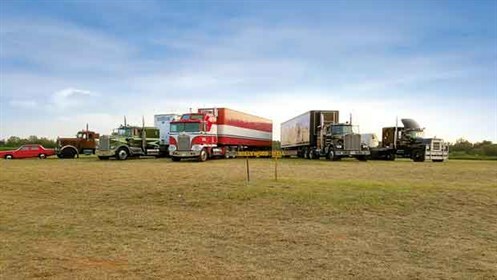 He has six 379 tractor units (5 Cat- and 1 Detroit-powered) and 50 trailers that are kept around five states. 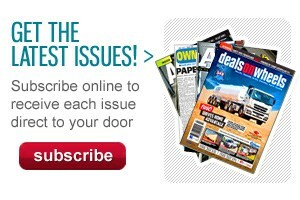 "We’re known here as a regional, hot rush, trucking company. And you may be surprised to know, our biggest cargo is swimming pool noodles. We haul 10–12 loads of those a day." He likes Peterbilts because they hold their resale value well and are strong workhorses. "They are basically hand- made, hand-riveted and are one of the only trucks today that have metal hoods; most are constructed with plastic and fibreglass. "If you look at the Duel truck and compare it to a new one, they still have many similarities." Brad owns more than 60 classic trucks, which he keeps in a 60x160 foot shed on his property. He also owns a recreation of the Smokey and the Bandit truck—a 1973 KW W900A with 350 Cummins. Along with a bunch of other friends, who are avid collectors, he runs an annual truck show known as Brad’s Southern Classic Truck Show. "Paul Sagehorn from Wisconsin has the original BJ and the Bear truck and trailer—a KW K-100 and the original KW tractor unit from the TV series Movin’ On. It’s a 1974 W-900 VIT and was one of the first Kenworths to come out with a double sleeper. Another friend, Anthony Fox, from Rome, Georgia bought the Rubber Duck, Mack RS700-L, Western, from the movie Convoy. For our 15th annual classic truck show in 2016, we had five movie rigs on top of the big hill and we called it Hollywood Hill. It was very cool and it was the first time they’d ever been together. We’re having it this year in September, so if anyone wants to see all these movie rigs in one spot, they should come on over." 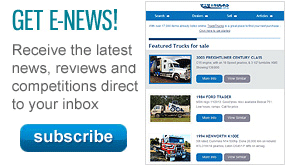 For more information, visit bradsclassictrucks.com.